There are 2 items on this page: (1) Getting a rise out of Concrete; (2) What made Roman Concrete so Good? about one-third of the way up the tall columns in front. In the year 1982 a series of small but violent earthquakes struck the port town of Pozzuoli near Naples. Some of them were strong enough to cause damage to buildings and were so psychologically unnerving that many residents of the town slept outside on the beach. (I was teaching school about one mile from Pozzuoli at the time, so I know about the "unnerving" part.) After all, this was only a short while after the great Irpinia quake of 1980 that had killed 3,000 persons in the mountains near Avellino just 85 km to the east. Were these phenomena connected? Are we due for another "big one"? Those questions remained unanswered while the city administration of Pozzuoli simply decided to evacuate 40,000 residents from the town, building very quickly a New Pozzuoli a short distance away. Some years later, things calmed down, and residents moved back to their beloved homes on the seafront, relatively pacified in the standard explanation that, no, these local movements of the earth had nothing to do with a “big one”—past or present. They were just “bradyseisms”, which just means 'small earthquakes in Greek, but if it's Greek, it's impressive, must be right, and you feel better. Bradyseisms are examples of “phreatic activity”—the violent reaction of magma (called 'lava' if it is flowing on the surface) and cold water. That creates steam, the steam creates pressure and tends to move pretty much anything in its path —a steam locomotive, the cover on your pot of boiling water, or the ground itself if that ground happens to be atop a magma chamber that has just come into contact with sea water, either by invading it or being invaded by it. Everyone knows that Pozzuoli is a volcanic area. It is the center of the Campi Flegrei (Fiery Fields), site of the great Campanian Ignimbrite eruption of 40,000 years ago, which produced the Archiflegrean caldera collapse (image, below, right), as well as the site of numerous secondary eruptions in the subsequent millennia. The whole area is still sitting on a chamber, or chambers, of volcanic magma in close proximity to seawater. That is steam waiting to happen. Is that what happened? Did the upward thrust from “phreactic activity” simply push the surface of the town of Pozzuoli upward by as much as 2 meters/6 feet in some places—in two years?! (The port became so shallow that it could no longer handle large vessels and had to be rebuilt.) Yes, indirectly, that is what happened; that is, without magma and seawater at the root of it all, none of this would have happened. (It remains important to realize that we are talking about what happened to the ground beneath Pozzuoli—it moved upward. This has nothing to with the real sea level in the bay.) But there is more to the story. An article by Ker Than entitled “Volcanic rocks resembling Roman concrete help solve a mystery, Stanford scientists say” in the July 10, 2015 on-line edition of the Stanford Report details the work of Tiziana Vanorio, an experimental geophysicist at the Stanford School of Earth, Energy & Environmental Sciences. She was herself a young resident of Pozzuoli in the 1980s, driven from her home by the micro-quakes and then driven into her profession to find out the geophysical secrets of her home town. She speaks of a “...a natural process in the subsurface of Campi Flegrei that is similar to the one that is used to produce concrete [...] Ground swelling occurs at other calderas such as Yellowstone or Long Valley in the United States, but never to this degree, and it usually requires far less uplift to trigger earthquakes at other places...at Campi Flegrei, the micro-earthquakes were delayed by months despite really large ground deformations." A caldera is a collapsed volcano. The town of Pozzuoli rests at the top of a caldera, an ancient volcanic crater, a crater now filled with various kinds of pyroclastic material—that is, remnants of past eruptions going back to the local Mother of All Calderas, the Campanian Ignimbrite (the area encircled by red lines in the image, right); that gigantic collapse is still 20 km in diameter! (Today, you can stand on one rim and see the other side, quite peaceful now. The entire Campi Flegei is in the middle.) The Pozzuoli caldera was a secondary event from a later, smaller eruption. 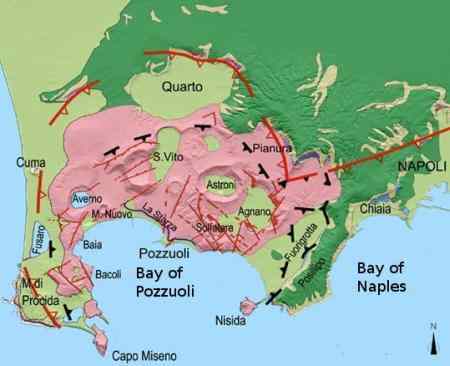 The nature of the material beneath the town is crucial to understanding why the sides and the bottom of the “bowl” of the Pozzuoli basin (caldera) underlying the modern town and port of Pozzuoli were able to withstand incredible strain from below without suddenly cracking. When it did crack, however, it did so very suddenly and violently. Oceanographic and geological research beginning in the 1980s revealed data that are the focal point of Vanorio's considerable publications on the subject. For example, the cap rock in the Campi Flegrei is rich in pozzolana, or volcanic ash, from the region. The cap rock is a hard rock layer located near the caldera's surface, it is on top of other pyroclastic material filling the caldera. It is the lid. Campi Flegrei cap rock contains fibrous minerals that are also found in man-made concrete, making it ductile and explaining why the ground beneath Pozzuoli was able to withstand significant bending before breaking and shearing. Those minerals came to be under Pozzuoli and, indeed, all of the Campi Flegrei, through—in very simplified terms—"decarbonation": the action of heat (magma) from below plus the steam pressure (from the seawater) produce several chemical compounds at the cap rock, such things as calcium hydroxide, also known as portlandite or hydrated lime, one of the two key ingredients in man-made concrete, including the famous Roman concrete. (Seneca noted that the "dust at Puteoli [Pozzuoli] becomes stone if it touches water." The cap rock is turned into a very solid barrier of natural concrete, potentially very beneficial because it can withstand great stress. Unfortunately, an excess of sea water injected into the mix produces an excess of carbon dioxide, methane and steam, which then becomes the irresistible force. The immovable object, the cap rock, moves after all. It shears, cracks and is forced up, pushing the surface and the town with it. And then people have to move. What Made Roman Concrete so Good? Now with extra added Pozzolana! Ask for it by Name! The image (above right) shows the arched pier in Roman Puteoli (Pozzuoli). Romae by J.P. Bellori (1615-1696), a French archaeologist. 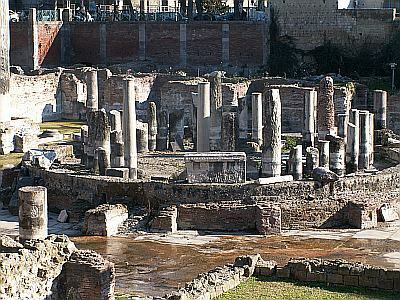 Also see link to The Roman Port of Pozzuoli at bottom of this page. It took anywhere from 15 seconds to four hours to drive by (depending on traffic! ), but I could usually make do with a short spiel on the order of "cement is the powder that you mix with water and sand and gravel to get concrete, the building material that sets and hardens." If traffic got slow, I had to "go long," stretch it by adding that cement is made from burnt lime and clay and technically is called a "binder" and that the sand and gravel you add are called "aggregates". Then (now it's really slowed to a crawl) I might have to add that the chemical name for lime is calcium oxide (CaO) and that if you make the aggregates finer, you can get other kinds of material such as mortar, which holds bricks or stones together in masonry, or plaster, used for the protective and decorative coating of walls and ceilings and for molding and shaping decorative elements. Only once, during the Mother of all Traffic Jams, did one of the group say something like "Hey, what about that aluminum tobermorite stuff?" He was an engineer, whom I easily distracted by pointing out the mermaids just off shore. Normal modern concrete does not hold up very well in seawater. In as few as 50 years underwater, it may start to decay. Even concrete reinforced with steel rods to increase the load-bearing strength of the concrete and to offset concrete's poor tensile strength will decay. On the other hand, there are submerged Roman piers on the west coast of Italy that are not only still standing, but — and this is the fascinating part — are structurally sounder now than when they were built! (That is what sparked my initial interest.) This is because they used what we call Roman concrete, which has significant differences in what is added to the mix; that is, the quality of the lime and the make-up of the aggregates. Philip Brune, a research engineer at Dupont, has studied the properties of Roman monuments and says that Roman concrete "...is the most durable building material in human history... [and] an extraordinarily rich material in terms of scientific possibility... ."
Marcus Vitruvius Pollio (born c.80–70 BC, died after c.15 BC) was known simply as Vitruvius and was the author of a multi-volume work entitled De architectura. He has been called "the first architect" but today we might call him a civil engineer; he was a true Jack of all Building Trades. Much recent research has gone on in the Gulf of Naples to determine just why he went to such pains to specify in his recipe for concrete a mixture of volcanic ash, lime, seawater, and volcanic rock, and, importantly, that the best volcanic ash comes from the Bay of Pozzuoli. That's the reason so many geological terms start with "pozz...": pozzolans, Pozzolana, pozzolonic ash, pozzolanic ativity, pozzolanic reaction, etc. (Pozzolana is capitalized because it is not generic; it is a specific proper noun — volcanic ash from Pozzuoli.) Vitruvius is most specific: there are two types of concrete: one for use on land and another for underwater. He specifies a ratio of 1 part lime to 3 parts pozzolana for cements used in buildings and a 1:2 ratio of lime to pulvis Puteolanus (same as Pozzolana, volcanic ash) for underwater work. Important in both cases is that Roman concrete was very heavy on the aggregate, so heavy that it might be called "rubble" by modern standards. Recent research has shown that the secret has to do with what happens chemically in the interaction between sea water and Pozzolana, the volcanic ash, dissolved in the water near Pozzuoli: new binding minerals actually grow in the concrete and produce within a short time a rare hydrothermal mineral called aluminum tobermorite. Al-tobermorite can be made in the lab but is difficult to incorporate into concrete. Yet when open seawater percolates through a cement matrix, it reacts with the volcanic ash to form Al-tobermorite and a porous mineral called phillipsite, both of which are necessary to fit Vitruvius' description of concrete exposed to seawater as: “a single stone mass, impregnable to the waves and everyday stronger.” Essentially, he invented what is called hydraulic (or hydraulic-setting) cement, which can be poured into wooden molds on land and then put in place underwater, or even poured underwater (!) into pre-placed molds as long as the cement is accurately guided into place by a conduit. (One presumes that the 1:2 ratio (underwater) is about where the aluminum tobermorite "threshold" was, the point where the crystals started linking and strengthening the mixture. Anything below that, you could use on land. When Pliny the Elder wrote (in his Ode to Concrete!) that "as soon as it comes into contact with the waves of the sea and is submerged, it becomes a single stone mass, impregnable to the waves") he was describing an ideal solution to many modern engineering problems. If the seas keep rising, think of the sea-walls that might be necessary to shelter shoreline environments. Think of the advantage of not needing reinforced steel to strengthen concrete when the concrete itself is packed with tiny crystals (that don't rust) that grow, expand, and spread, linking up to actually strengthen the concrete as the years pass. It bears emphasizing that this entry was primarily meant to deal with the successful use of a very special kind of Roman concrete used in underwater environments. Modern engineering reinforces concrete for use on land — buildings, bridges, etc. — to deal with the conflicting properties of concrete and steel: concrete is said to be strong when compressed, but weak under tension; steel is strong in tension but weak under compression. Thus, structural engineers try to place the "rebar" (short for 'reinforcing bar,' the metal used, usually steel or iron) where the finished product — the building or bridge — strikes a balance between tension and compression. That has little to do with structures meant to be constantly exposed to seawater percolating through a concrete matrix (such as Roman seawalls on the coast) and growing stronger by the year through the magic chemistry of Pozzolana volcanic ash. Yet the Romans were very adept at building on land and we should not forget the role that Pozzolana played in the countless Roman bridges, aqueducts, and buildings. Even if not constantly reinforcing itself through constant exposure to seawater, the 1:3-ratio concrete used on land was infused with Pozzolana and was strong. The Pantheon in Rome (image above) still contains the largest unreinforced concrete dome in the world more because of the incredibly refined architectural devices used to minimize the tensile forces on the concrete — that is, nothing is pulling the concrete apart; the concrete dome is practically all under compression, not under tension. A simple look at the cutaway image reveals some of the tricks the Romans used: the outside of the dome is stepped for example; every step represents concrete that was cut away and jettisoned, so to speak, to save weight. The "oculus" (eye) at the top (1) saves weight (it's a hole!) and (2) lets a shaft of sunlight in, one of the most attractive aesthetic features of the Pantheon. (It might have been a heavy slab of concrete!) Very refined is the fact the wall of the dome gets progressively thinner (thus lighter) as it goes up. Inside there is no extra baggage, no ceramic pots, busts, none of that. On the contrary, there are a great number of "coffers", decorative sunken panels, each one a spot where even more weight was cut out and thrown away. By some estimates, the engineers saved 80% (!) of what might have been the weight of a full-blown don't-spare-the-concrete version of the dome with no attempt to trim it down, which, we note, wouldn't have lasted very long. A final silly note, and I include this only as a quantum afterthought (by which I mean that nothing is so outlandish that it is not possible) is that the profile of the Pantheon dome sure looks like a Fresnel lens in optics and maybe this is where Augustin-Jean Fresnel (1788–1827), the French engineer, got the idea for his annular ring design (allowing the construction of multi-part, thin, light lenses without the size and weight required by lenses of conventional design. If I had a time machine, I would go back and ask him "Augie, c'mon. I won't tell. You got this stepped idea from the Romans, right?" One last thing (only partially silly!). The confusion between cement and concrete is due to the fact the Romans, themselves, in Latin, called the building mixture (what English speakers call "concrete") opus caementicium. Modern Italian uses calcestruzzo (calcium + structure) for all 'concrete' (Roman or otherwise) but also cemento armato — armored cement (for Roman concrete) presumably because it is armored with bits and chunks of volcanic aggregate. Italian has no noun concreto, just the adjective concreto, but only in the sense of a "concrete solution." Don't ask about Spanish. Really, please. Don't ask. Oh, in Italian, struzzo also means ostrich, in which case you've got yourself a bridge with added protein! The plot thickens. Eventually it will harden. My thanks to Preston Lamp for his comments and help. Any mistakes or oversimplifications are mine. The Secrets of Ancient Rome's Buildings in Smithsonian Magazine. Jackson, Marie D.; Mulcahy, Sean R.; Chen, Heng; Li, Yao; Li, Qinfei; Cappelletti, Piergiulio; Wenk, Hans-Rudolf (2017). "Phillipsite and Al-tobermorite mineral cements produced through low-temperature water-rock reactions in Roman marine concrete". American Mineralogist. 102 (7): 1435–1450. doi:10.2138/am-2017-5993CCBY. ISSN 0003-004X.